The Undead Drive-Thru ebook by Rebecca Besser is free for Kindle from October 29th-30th! Click on cover art to visit title on Amazon! When Kyndra, Colleen, and Jose apply for jobs at a diner that has seen better days and is undergoing renovations, they have no idea what they’re in for. Aunt-B and John have a horrible secret, and when it’s unleashed on the unsuspecting employees of the diner, things get . . . complicated. Bloodthirsty and dangerous, a zombie awaits the opportunity to feast on them all. Who will be served first? Can any of them make it out of the Undead Drive-Thru alive? Author Rebecca Besser is the author of “Undead Drive-Thru, Undead Regeneration, Cursed Bounty, Twisted Pathways of Murder & Death, Hall of Twelve, the Zpoc Exception Series: Re-Civilize,” and “Nurse Blood (Limitless Publishing).” She’s also a graduate of the Institute of Children’s Literature. Her work has appeared in the Coshocton Tribune, Irish Story Playhouse, Spaceports & Spidersilk, joyful!, Soft Whispers, Illuminata, Common Threads, Golden Visions Magazine, Stories That Lift, Super Teacher Worksheets, Living Dead Press Presents Magazine (Iss. 1 & 2), FrightFest eMagazine, An Xmas Charity Ebook, The Stray Branch, and The Undead That Saved Christmas (Vol. 1 & 2) and the Signals From The Void charity anthologies. She has multiple stories in anthologies by Living Dead Press, Wicked East Press, Pill Hill Press, Hidden Thoughts Press, Knight Watch Press, Coscom Entertainment, Crowded Quarantine Publications, and Collaboration of the Dead (projects), and one (each) in an anthology by Post Mortem Press, NorGus Press, Evil Jester Press, Horrified Press, Atria Books (S&S Digital), and Nocturnal Press Publications. She also has a poem in an anthology by Naked Snake Press and a children’s poem in Oxford Ink Literature Reader 4 from Oxford University Press (India). Her nonfiction children’s article about skydiving, written for her writing course with the Institute of Children’s Literature, was published by McGraw Hill for NY Assessments. She’s also an editor and have edited: Dark Dreams: Tales of Terror, Dead Worlds 7: Undead Stories, and Book of Cannibals 2: The Hunger from Living Dead Press; Earth’s End from Wicked East Press; End of Days: An Apocalyptic Anthology (Vol. 4 & 5/co-edited) from Living Dead Press; and I’ve co-editing Feast or Famine (a zombie anthology). When she’s not busy writing and/or editing, she’s formatting book covers, building/maintaining websites, and writing book reviews. Halloween Season – Books on Sale and Free! Undead Drive-Thru for Kindle is on sale until Oct. 31st. Undead Regeneration for Kindle is on sale until Oct. 31st. Twisted Pathways of Murder & Death will be free for Kindle on Oct. 31st & Nov. 1st for #AllHallowsRead! Cursed Bounty, a zombie western, will be free for Kindle on Oct. 31st & Nov. 1st for #AllHallowsRead! ©Rebecca Besser, 2016. All Rights Reserved. For horror authors and fans, Halloween equals Horror Christmas in that there are endless horror giveaways and events! We get to party in the scary world for a little while without people looking at us like we’re crazy. As a horror author, I try to have sales and giveaways to contribute to the festive horror season. And I want to make sure you don’t miss out on anything I have to offer for Halloween! 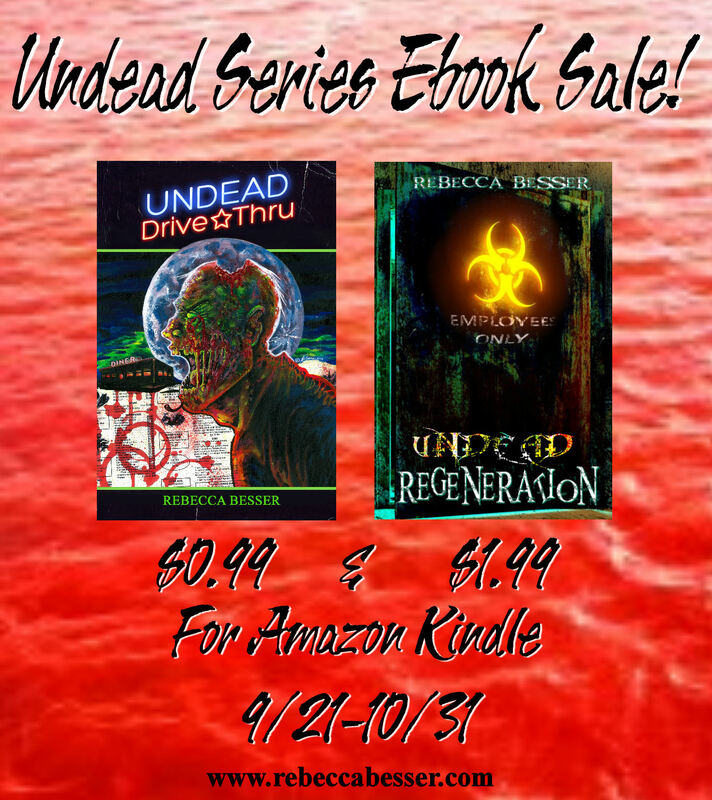 Currently, both of my Undead Series Kindle ebooks are on sale, and they will be until the end of October. I’m taking part in the 13 Days of Hallowen #StrangeAuthors with Limitless Publishing. Nurse Blood for Kindle will be on sale for $0.99 from Oct. 28th-Oct. 31st! Click on cover pic to visit Nurse Blood on Amazon! If you have any questions about what I have going on, let me know! Happy Halloween (Horror Christmas! ), everyone! Visit Undead Drive-Thru Kindle Ebook on Amazon! The zombie is gone…finally and truly dead. John and Ky try to get on with their lives, but they can’t. They are haunted by the past and it’s tearing apart their future. With no other options, they go undercover where Sam had worked before he came home…undead: ReGen. They struggle with their circumstances, their fears, and their relationship as they fight to tame their nightmares and create a happy and healthy future together. Visit Undead Regeneration Kindle Ebook on Amazon!